For what is believed to be the first time anywhere in Japan, elected officials have openly condemned the consumption of dolphin meat, especially in school lunches, on grounds that it is dangerously contaminated with mercury. 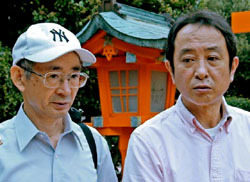 In an exclusive interview with The Japan Times held in Kii Katsuura, Wakayama Prefecture, on July 19, Assemblymen Junichiro Yamashita, 59, and Hisato Ryono, 51, from the nearby whaling city of Taiji said they had found extremely high mercury and methylmercury levels in samples of meat from pilot whales killed inshore by Taiji hunters and put on sale in that locality. The pilot whale, or “gondo” (Globicephala macrorhynchus), is the largest of the dolphin family of small cetaceans. This species is among some 2,300 dolphins slaughtered annually in Taiji, after the mammals are herded in “drive fisheries” into small coves, where they are speared and hacked to death. 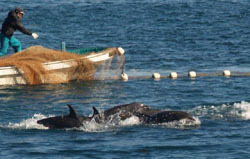 Similar hunts elsewhere in Japan are estimated to account for at least another 20,000 small cetaceans annually. The random samples tested by the two assemblymen were bought at supermarkets in Taiji and nearby Shingu, and were similarly sourced to the meat served to children in whale-meat lunches at Taiji schools. Such lunches may also have been served in schools in other prefectures, the Taiji officials said. 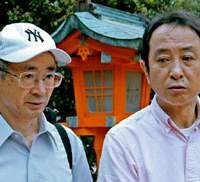 Yamashita and Ryono defied the code of silence traditionally shrouding sensitive issues, especially one that could threaten the economy of their small, isolated fishing town on the scenic Kii Peninsula. Asked why, they said local people were getting very anxious about food safety in Japan. Recent reports of contaminated products from China have heightened their concerns, they said. He said that although they had doubted the pilot whales were contaminated with mercury, they decided to have certified lab tests carried out nonetheless. “We tested some samples — purchased at the Gyokyo supermarket in Taiji and Super Center Okuwa in the nearby city of Shingu,” Yamashita said, adding they were “shocked” by the results. One dolphin sample had a mercury content 10 times above the health ministry’s advisory level of 0.4 parts per million, with a methylmercury readout 10.33 times over the ministry’s own advisory level of 0.3 ppm. Another dolphin sample tested 15.97 times and 12 times above advisory levels of total mercury and methylmercury, respectively. In fact, the dolphin levels were higher than some of the mercury-tainted seafood tested during the tragic Minamata mercury-pollution disaster of the 1950s, according to Dr. Shigeo Ekino of Kumamoto Medical Science University in Kyushu. In that episode, thousands were sickened, disabled or died in the toxic chemical disaster. Ekino is famous for his breakthrough study of brain specimens from deceased Minamata disease victims that reveals how even low levels of methylmercury can damage or destroy neurons. After they received the test results, the Taiji lawmakers, anxious about the possible toxic effects of pilot-whale meat consumed by local schoolchildren, quickly contacted Masahiko Tamaki, an official of the Wakayama pre-fectural health section, and showed him the test results from their samples. 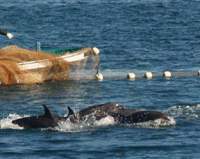 Despite the Taiji pair’s urgent health concerns, however, Taiji Mayor Kazutaka Sangen plans to build a new slaughterhouse for processing meat from pilot whales and other dolphins caught during globally condemned drive fisheries there. He also wants to expand the provision of school lunches containing pilot whale meat. Top researchers in Japan’s medical community have also voiced concern about the high levels of mercury found in small-cetacean food products. Tetsuya Endo, a professor and researcher at Hokkaido Health Science University’s faculty of pharmaceutical sciences, affirmed the other doctors’ condemnation of small-cetacean food products. In 2005, Endo published the results of a three-year study on random samples of cetacean food products sold throughout Japan, and concluded all of it was unhealthy because of high levels of mercury and methylmercury. However, Hideki Moronuki, deputy director of the government’s Far Seas Fisheries Division of the Resources Management Department, in an interview with The Japan Times, maligned Endo’s study, calling it “misleading information.” When pressed, though, he failed to substantiate his accusation. This bureaucrat’s attitude flies in the face of certified copies of six test reports commissioned and paid for over the past year, each showing high mercury levels in the meat put on sale from all dolphin species tested. That data have been made freely available by The Japan Times to the appropriate Japanese government agencies and officials. Despite this hard data, government authorities have consistently displayed a sense of apathy toward these matters, and what many informed commentators regard as dangerously cavalier attitudes in dealing with urgent health issues affecting their citizens. Makoto Tanaka, assistant director of the health ministry’s inspection and safety division in the Food Safety Department, would only say that he is seeking an international standard for establishing a new advisory level for consumers of mercury-tainted food products. The health ministry has been aware of the mercury problem in small cetaceans (not to mention in the meat from great whales) for many years, but so far it has refused to ban the sale of such food products. In particular — despite unequivocal scientific test results — it has failed to require the posting of warning labels for consumers of dolphin meat. This approach continues despite an advisory order, Kan Nyu Dai 99 Ban, established July 23, 1973, under which a warning was issued to prefectural and local governments by the then director of the environmental and health agency, stating that mercury in seafood must not exceed the advisory level of 0.4 ppm. Although still in effect, enforcement of the advisory order by governors and mayors has been lax and unchallenged. But the reaction around the killing coves of Taiji was swift in confronting the two assemblymen’s health concerns. On the one hand, Gyokyo, the leading local supermarket, pulled pilot whale meat off its shelves, and will not resume its sale, according to Takuya Kondo, assistant director of the health ministry’s Department of Food Safety’s Standards and Evaluation Division. Yamashita and Ryono believe many people in Japan are unaware of the (health) problems related to consuming dolphin meat, and they say they want to educate people through an Internet blog currently posted by the Save Japan Dolphins coalition, an international conservation group. But it would be a lot more straightforward if this issue was addressed in a more open and accountable way by officials. Instead, a pervasive sense of paranoia seems to loom over any investigation of the mercury contamination of foodstuff in Japan. On this reporter’s initial visit to the test lab, my sample of dolphin meat was at first rejected for testing by lab officials, who greeted me with a file of my articles on the barbaric dolphin slaughter in Taiji, and the toxicity of cetacean meat sold in Japan. The lab later conducted the test after learning the test-sample result would determine whether a potentially dangerous public-health hazard existed. Also, during the dolphin drives and the animals’ subsequent slaughter in Taiji, I was stalked nonstop by shady-looking characters just a few meters behind me wherever I went. Police also attempted to question me several times and, to my considerable consternation, all seemed to know my name exactly as written on my driver’s license — even though only my hotel had a copy of my license. Perhaps the two courageous assemblymen may have sounded the final death knell to Japan’s dolphin slaughter by focusing the spotlight on the toxic products of this butchery. But how many Japanese may already be adversely affected, so many years after the danger of this cruel trade has been known?